Ride report: 33 nightriders on a fine warm evening rode the route, checked out the views all the ay up to Ringinglow and back, chatted about paintings, Sheffield, and anything else. Finished at Pearl St as we had dawdled so much just enjoying chat, company and cycling A handful ended up at the Gardener’s for a pint or two. Great ride and I (Mick) particularly liked going down Ringinglow Rd and letting the bike do the work! 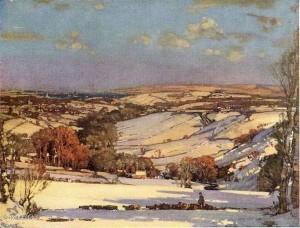 The theme: Sheffield Paintings. A while ago we did a ride to the locations of the Sheffield Quartet. PLUS one or two by Jonathan Wilkinson, whose work we rode to see in Jan 2014 and some works by our very own nightriding artist Dave Akehurst. So I have ‘hung’ the ride on three of the Sheffield Quartet and filled in en route with the viewpoints of some other paintings in the Picturing Sheffield Gallery at Weston Park Museum. If you haven’t been to this gallery I hope this ride encourages you to go. I hope this brilliant summer continues and I have planned the ride via Crookes where Stanley Royle painted a view of Sheffield from a reservoir (now filled in) to the top of the Mayfield Valley, the location of Stanley Royle’s painting of Sheffield from there (btw he painted this en plein air in the winter). I went to the Picturing Sheffield Gallery in June to check what is hung there at the mo’ and I have marked viewpoints of the landscape paintings in the gallery on the Google map but we won’t have time to visit or stop at them all – but, hey!, why not have a sunny Sunday urban bike ride and go look for yrself? Enjoy! I​ have to add thumbnails of Dave Akehurst’s paintings and the ones I have added are mainly around Sharrow. ​​Google ​m​ap of the route – nearly every POI marker is linked to some info about the relevant painting so pls take a look and bring a gadget, eg phone, tablet, that you can use to gaze at the painting as you stand at the spot. ​Ride with GPS map​ of the route – I’ve put this in so you have some idea of the of the climbs & descents – climbing up the Mayfield Valley is tough towards the end, the return to town is thrilling …. ​Heads up! Nigh on 15 miles, bring spare inner tube, lights and lock. Dress appropriately for going to a party. Cash bar, and a band or maybe two playing and then a private party after midnight if any of us are still standing. Anybody or anybodies willing to make a cake – or two? Let us know. …. the ride goes on ….